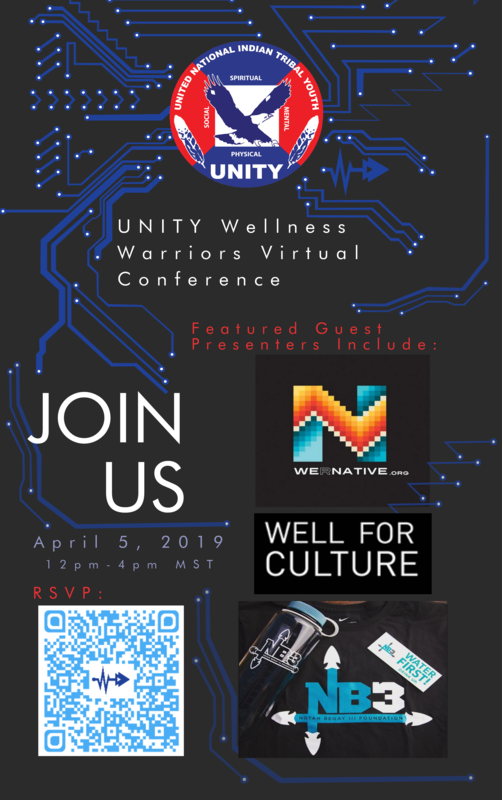 UNITY Wellness Warriors Virtual Conference “Indigenous Approaches to Wellness” – UNITY, Inc. Please join us for UNITY’s first ever Wellness Warrior Virtual Conference! In efforts to be inclusive of Native youth who are unable to attend our Conferences in person, we are live-streaming this free interactive training for Youth Councils to watch together! Contact us for ideas on hosting your own Watch Party! The virtual conference will be held Friday, April 5, 2019 from 12pm-4pm MST/PT. The four-hour virtual conference will focus on decolonization and ways Native youth can be active in building healthier communities through grassroots efforts. There will be engaging speakers, panels, and breakout sessions. The four-hour conference is split into two two-hour sessions, one for adult advisors and one for youth. You may choose to join us for the entire conference or pick one session. You may join us virtually or in person. For those who wish to participate in the Live Audience, it will be held at Arizona State University in the Fulton Center Lincoln Conference Room (300 E. University Drive, 6th floor room 6440 – Cross streets are College Ave and University Drive on ASU Tempe Campus). An agenda will be posted soon. We look forward to your participation!